Sometimes, I see faces in things. For example, do you see the cute face in this bowl of ice cream? Or, how about the frog face in this cup of coffee? If you keep your eyes (and mind) open, you’d be surprised at just how many faces start to reveal themselves to you. It’s pretty amazing if you ask me and that’s exactly why I’ve fallen in love with the Twitter account appropriately named Faces in Things. And I’m not the only one that adores this particular Twitter account! My speech therapy students do, too! Ya see, my students are obsessed with smart phones. From Androids to iPhones and everything in between, they are just so fascinated with those magical, pocket-sized communication tools. So, in an effort to keep them motived during speech, I came up with the idea to whip out my iPhone to share a few pictures from the Face in Things account with them (I just knew they’d dig the pics!). This action triggered so much conversation at the beginning of our session. You gotta give this idea a try! What speech therapy goals and objectives did I target while exploring the pictures on the Face in Things account? Their receptive language skills were practiced because I encouraged them to identify certain parts of the picture by pointing (point to the helicopter’s mouth or point to the house’s sleepy eyes) and they were able to practice spatial concepts because I asked them to describe the picture while using words like on/off, up/down, above/below, front/back, next to, and middle (“I see the people ON the silly raft and they are going DOWN the river.“). Using your smart phone/cell phone/mobile device/ whatever it’s called to show pictures from Faces in Things is a perfect way to educate your speech therapy students. My above expressive and receptive language examples are only the beginning. 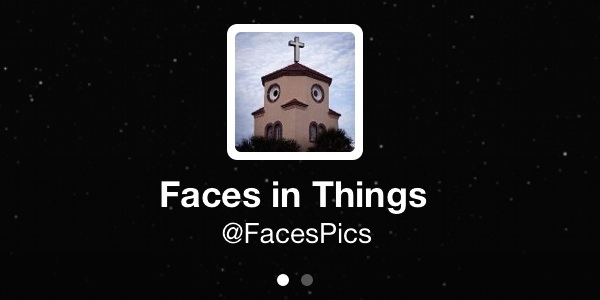 There are dozens and dozens of other ways to incorporate the pictures into any session and I would like to thank whoever created the Faces in Things Twitter account (you rock!). I wonder how you, as a speech-language pathologist, will use the pictures in your speech therapy room? Please, keep me updated because your ideas are always out of this world. As always, I look forward to hearing from you.